Be the first to share your favorite memory, photo or story of Darlena. This memorial page is dedicated for family, friends and future generations to celebrate the life of their loved one. 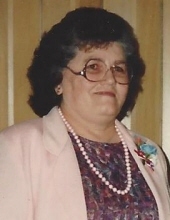 Darlena was born on May 1, 1936 to the late Matthew and Amanda Caudill. She was the last of 8 children. She graduated from Memorial High School in 1954 at Waynesburg, KY, and married Howard Roberts in Jellico, TN in 1954. From this union she had 4 children, Howard Michael Roberts, Jeffery Earl (Karen) Roberts, Sallie (David) Utter, and Ossie Matthew Roberts. Darlena married Richard Broady of Great Lakes, Minnesota in 1979 and moved to Minnesota to make their home. Darlena has devoted her life to helping the veterans for 35 years in Minnesota (she was president of the local post 7818 for 8 terms and district president for 2 terms. She was a Life Member of the Purple Heart, member of the American Legion, and Life Member of the Disabled American Veterans. She was a two time local Commander and a 7 time State Commander of Minnesota. She moved back to Kentucky in 2008 and became commander of the DAVA #1 of Lexington, KY until 2018. She was a member of American Legion Auxiliary and President for 2 years of Post 24 in Georgetown, KY.
Darlena was preceded in death by both parents, two brothers (Othie Ray and Franklin), two sons (Howard Michael and Ossie Matthew), sister (Edna Ware), grandson (Guy O'Connor), and ex-husband (Howard Roberts). Besides her husband and children, Darlena leaves behind 8 grandchildren, 16 great grandchildren, and 5 great-great grandchildren. Visitation will be 1:00-2:00pm Sunday, November 11, 2018 at Tucker, Yocum, & Wilson Funeral Home with service beginning at 2:00pm with Pastor Dwayne Russell officiating. Graveside service will be 9:00am Monday, November 12, 2018 at Camp Nelson Cemetery. Pallbearers are to be her grandsons and grandsons-in-law, Richard Harriss, Nicholas Ray, Anthony While, Jamey Maupin, David McKenzie, Vincent O'Connor, and Travis Roberts. Online condolences may be sent to the family at www.tuckeryocumwilson.com. To send flowers or a remembrance gift to the family of Darlena (Caudill, Roberts) Broady, please visit our Tribute Store. "Email Address" would like to share the life celebration of Darlena (Caudill, Roberts) Broady. Click on the "link" to go to share a favorite memory or leave a condolence message for the family.